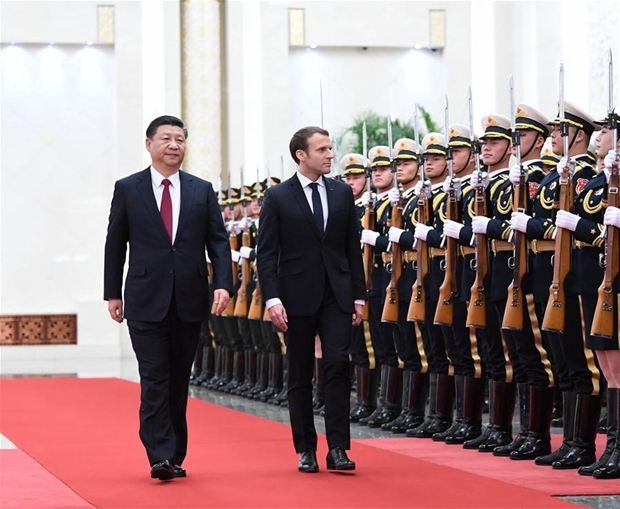 The China-Europe diplomatic calendar for 2018 began with a state visit to China by French President Emmanuel Macron. The timing is significant: France is attempting to portray herself as the natural leader of the European Union, now that Britain is withdrawing and Germany is having great trouble forming a new government. Obviously it is natural that a relatively new French President will wish to demonstrate respect and goodwill towards China – France is after all a fellow permanent member of the UN Security Council and thus a major player in global affairs – and praise was accorded to China for the latter's commitment to a multilateralist approach and her willingness to engage globally on issues such as climate change and terrorism. However, there are a number of other reasons why President Macron should be keen to get Sino-French relations off to a good start. Macron wishes to underpin his country's status as de facto leader of the European Union, one of China's top trading partners. In this capacity he was bold enough to address some of the potential obstacles to full mutual understanding, calling for a "balanced collaboration" between China and the EU. Macron did not sweep under the carpet the long-standing issues between Europe and China, and he referred clearly to the French view that China's reluctance to open fully some of her domestic markets remains one of the obstacles which needs clearing. The French approach to this issue is not exactly confrontational, but it is firm-handed, justifying recent decisions to restrict the scope of Chinese investments in France combined with a push to tighten the screening of Chinese investments in the EU and exercise a degree of protectionism in designated strategic sectors in France, and more widely in the EU (sometimes Macron gives the impression that he does not see any difference between France and the EU). His words, "we want to facilitate Chinese investments in Europe in predefined sectors" imply a powerful negative. Yet, apart from these core interests, President Macron attempted to give every possible signal of a willingness to play along with China's approach. He started his visit not, as usual, in Beijing, but in Xi'an, where he presented President Xi with a fine French horse. This was, of course, symbolic of a strong French/European desire to participate whole-heartedly in China's Belt and Road Initiative (BRI) – and, by implication, to concentrate activities at the European end of the BRI on France. Macron did, however, point out meaningfully that the road should not only permit traffic to travel in one direction. There are many aspects of Franco-Chinese relations which are not at all contentious and which will make good foundation stones for successful collaboration. Following the U.S. withdrawal from the Paris Climate Change Agreement, almost a year ago now, Macron was able to re-emphasize France's clear commitment to the programme. One area where the relationship is strong is nuclear cooperation: Now that Britain is leaving the EU, and that Germany has now almost wholly withdrawn from nuclear power generation, France is the unchallenged leader of the pack in this field, and one of the major deals done during the summit took the form of a boost to negotiations on the Chinese purchase of a $12 billion nuclear fuel recycling plant from French state-owned company Areva. A long-standing Chinese embargo on French beef products will also be terminated this year. The large delegation of business leaders accompanying Macron also claimed many lucrative contracts, though to what extent these were really dependent on this Presidential visit is uncertain. Thus the visit can be said to have been a success for both sides, though a lot will depend on whether China takes offence at Macron's implied criticisms of Chinese "protectionism." Macron's bid to display leadership of the EU, at least in the context of trade, was also successful on the whole. But the French will not be contented with the leadership of the now-reduced EU: Macron always has one eye looking northward, across the English Channel to the U.K.
Britain is France's real rival, not the other nations of continental Europe. And Britain has firmly espoused the free trade agenda to which China is committed. Britain does not complain about protectionism or impose restrictions on inward investment. And Britain, now de-linked from continental Europe and able to set her own course, is particularly dependent on establishing the closest possible relations with the newly-emerged major trading nations such as China and India. Britain also has a longer record of constructive trading in East Asia. And so President Macron knows he has a fight on his hands, not of course with China, but with his country's neighbor and old adversary. Still, this visit showed him able and willing to seek maximum cooperation with one of the largest players in the game. Britain is France's real rival, not the other nations of continental Europe. And Britain has firmly espoused the free trade agenda to which China is committed.